When we think of sites of animal research that symbolize modernity, the first places that come to mind are grand research institutes in cities and near universities that house the latest in equipment and technologies, not the surroundings of the bird’s nest, the octopus’s garden in the sea, or the parts of inland lakes in which freshwater plankton reside. Yet during the late nineteenth and early twentieth centuries, a group of zoologists began establishing novel, indeed modern ways of studying nature, propagating what present-day ecologists describe as place-based research. Raf De Bont’s Stations in the Field focuses on the early history of biological field stations and the role these played in the rise of zoological place-based research. Beginning in the 1870s, a growing number of biological field stations were founded—first in Europe and later elsewhere around the world—and thousands of zoologists received their training and performed their research at these sites. Through case studies, De Bont examines the material and social context in which field stations arose, the actual research that was produced in these places, the scientific claims that were developed there, and the rhetorical strategies that were deployed to convince others that these claims made sense. From the life of parasitic invertebrates in northern France and freshwater plankton in Schleswig-Holstein, to migratory birds in East Prussia and pest insects in Belgium, De Bont’s book is fascinating tour through the history of studying nature in nature. "While museums, labs, and botanical gardens have been widely studied by historians of science, field stations have received comparatively little attention. Raf De Bont's new book rectifies this oversight, turning our attention to the importance of biological field stations in the late nineteenth and early twentieth centuries in generating new scientific practices, theories, and networks. . . . A fascinating study that offers readers a more robust and complex understanding of the spaces of modern science and their entangled histories." "Stations in the field provides crucial insight into the origins of the biological field station – a surprisingly neglected space of modern science. By examining the “station movement” among animal researchers in Europe during the late nineteenth and early twentieth centuries, de Bont reveals an important intellectual and cultural development: the rise of place-based perspectives in biology. Stations in the field should be read by a broad audience of historians of the life sciences and biologists alike. Readers whose interests centre on the history of science in the museum, laboratory and field will find much to provoke thought, as will scholars interested in the intersection of professional and civic communities of biology. With clear and engaging prose, De Bont’s book narrates the rise of place-based biological research alongside its key institution. It demonstrates the fruitfulness of historical approaches that are as attentive to the nuance and diversity of place as were de Bont’s protagonists." "Historian of ecology de Bont reframes our understanding of biological stations, which have generally been described as places where scientists researched evolution and development, thus investigating inheritance in different ways. De Bont steps away from literature that has addressed the rise of laboratories to focus instead on the institutions that ‘provide researchers with their own scientific habitat, within the larger habitat of the organisms they study. De Bont’s book is rich with historical details about the rise of biological stations in Europe....Undoubtedly worth reading, as it proposes a novel historical interpretation of the phenomenon of zoological stations by looking at institutions whose scopes had long been ignored." 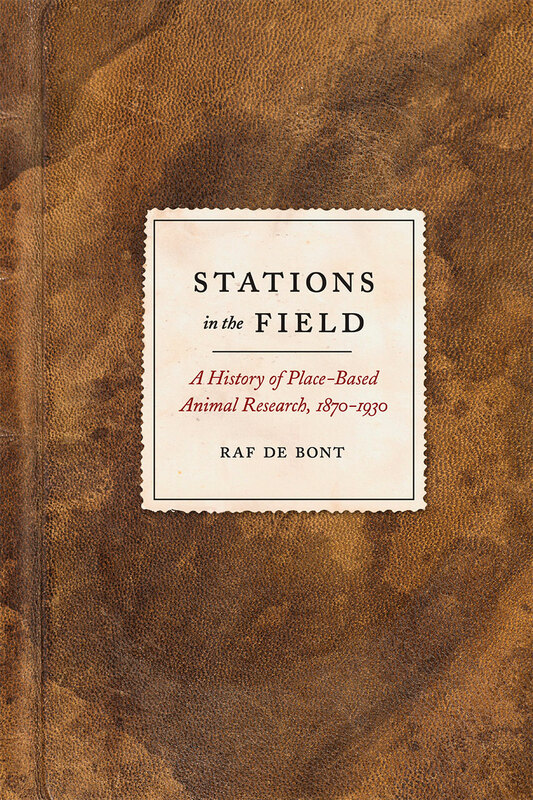 "Raf de Bont's Stations in the Field: A History of Place-Based Animal Research provides a fascinating look into the emergence of field stations. Replete with engrossing stories and insights into the history of science, casual readers and historians of scientists alike will be sure to find it delightful." "Raf de Bont’s study of European biological field stations transforms our understanding of the settings and strategies of late-nineteenth biological research. With a keen eye to their diverse ecological and socio-cultural contexts, he examines a variety of field stations, each committed to the study of animals in their natural setting. Immensely rich in comparative perspectives, equally insightful in what it adds to our historical understanding of lab work and field work, this book is an important contribution to the history of biology and to the growing literature on geographies of scientific knowledge." "Raf de Bont provides a cornucopia of material in terms of diversity and origin. Primary sources are carefully developed and presented in an interesting and compelling way, eventually nicely composed together, without getting lost either in the ocean of data or in simplistic conceptual and interpretative schemes. In this respect, the book offers interesting insights for scholars of the history of science, STS, and cultural studies, as well as for the wider public concerned about environmental issues." "In Stations in the Field, Raf de Bont traces the history of five European field stations dedicated to animal based studies at the turn of the twentieth century. To date, historical accounts of field stations have focused primarily on the well-known Naples Zoological Station and the subsequent American marine stations that sought to recreate the Naples model. Stations leads a growing body of literature shifting focus from archetypal stations in order to investigate wider themes in the history and sociology of biology. De Bont’s book is both a much-needed addition to the literature on biological stations and an important entry into the debates about the lab-field boundary in biological research."